Google Drive is a safe place for all your files and puts them within reach from any smartphone, tablet, or computer. Files in Drive – like your videos, photos, and documents – are backed up safely so you can’t lose them. There are many reasons for Spotify users to upload their Spotify music or playlist to Google Drive. Either for backup purpose or getting more space on computer, etc. However, as Spotify is mainly an online streaming music service, it's almost impossible to upload the Spotify songs to Google Drive. Spotify, one of the most popular digital music services, provides easy access for us to millions of hot music online. It provides two kinds of membership for users to subscribe, the Free plan and the Premium plan. The Premium subscribers have the right to download Spotify songs for offline listening. Even so, it's impossible to take Spotify music outside Spotify application and upload to Google Drive. But that's not the end of the story. 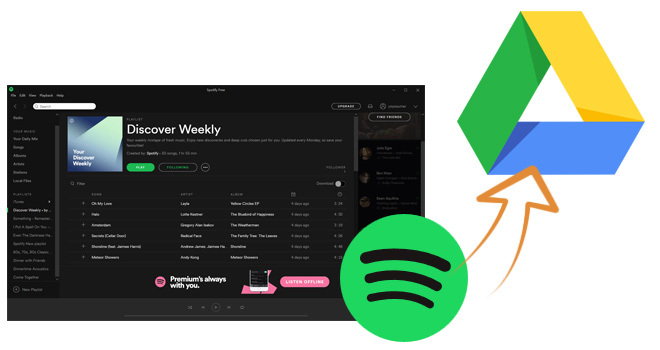 Here we'll introduce a smart program to help you easily convert any Spotify music to MP3 format so that you can transfer Spotify music to Google Drive effortlessly. The following is a detailed tutorial about how to upload Spotify music to Google Drive. Please download this useful tool on your computer first before getting started. When finish customization, click "Convert" button to start downloading. After downloading, you can get offline Spotify music, and transfer to Google Drive.